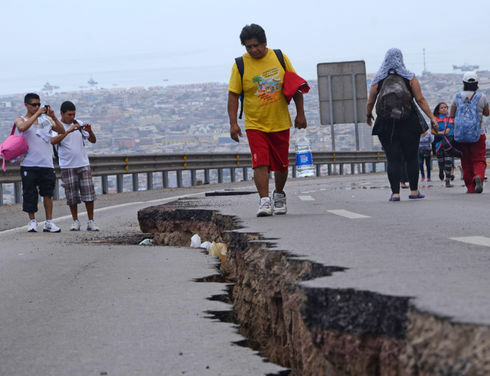 (Infosurhoy) IQUIQUE, Chile – A new, powerful 8.2-magnitude earthquake hit northern Chile late during the night of April 2, a day after an 8.2-magnitude earthquake prompted the government to issue tsunami alerts and evacuate 972,457 people along the entire Chilean coast. The earthquake on April 2 was part of more than 200 aftershocks, forcing the government to reissue a tsunami alert for three hours to residents along the coast. No new deaths were reported after six died on April 1. Chilean President Michele Bachelet was in Arica, which was evacuated after being one of the cities hardest hit by seismic activity. The area, which includes the northern cities of Arica and Iquique, has recorded more than 400 earthquakes from March 16 to April 1. One hundred twenty-two residences were damaged in Iquique, where thousands of residents spent the night in the Tierra de Campeones stadium and received assistance from authorities, officials said. Thirty percent of the Iquique Regional Hospital sustained damage, with several surgery rooms the hardest hit, according to the Health Ministry. The government said the Army will install a mobile field hospital to provide medical assistance to residents. Between 70% and 80% of all fishing boats in the Riquelme fishing cove in northern Iquique were destroyed or severely damaged, according to fishing industry spokespersons. A crane is being used to retrieve sunken boats. Economy Minister Luis Felipe Céspedes said the government will assist the fishermen who lost their livelihoods. In Huara, about 76 kilometers north of Iquique, the local church’s tower fell and several houses were destroyed. In Alto Hospicio, an Iquique suburb, 2,500 houses experienced structural damage, officials said. Several world figures reacted to the news of the quake. Authorities from Argentina, Canada, the Dominican Republic, Guatemala, Japan and Spain also expressed their sympathies to Chileans. Margareta Wahlström, the head of the United Nations Office for Disaster Risk Reduction, praised the Chilean government’s actions. Bachelet visited the local coastal town of Camarones in the Arica-Parinacota region on April 3. Classes were suspended for the Arica-Parinacota, Tarapacá and Antofagasta regions. “There are situations that can be resolved today and others that will require more time,” she said. Previous articleIs Nicaragua as Effective at Deterring Drug Trafficking?